The Burhani Polyclinic is a charitable healthcare clinic for the residents of the Haraaz inYemen. It began as a weekly clinic in which doctors from overseas and the capital Sana’a travelled to Hutaib to provide basic health care in a small one-room clinic. The operations were quickly expanded to include a weekly outreach trip to the other remote mountainous villages of Haraaz. Within a short span of time they had visited all of the 50 villages in the region and collected patient data for the inhabitants for the very first time. It quickly became clear that primary maternal, paediatric, and dental health care were the most urgent medical needs of the residents of Haraaz. Thus, in 2006, planning began for a full service maternity and primary health centre near Hutaib in the village of Zahra. In 2007, during Syedna Burhanuddin’s 96th birthday celebrations in Yemen, the new maternity services in Zahra were inaugurated and commenced with the joyful birth of a baby girl. Pregnant women are given a complete evaluation, including ultrasound followed with regular checkups. Special emphasis is given to education about hygiene and good nutrition. At around the same time a state-of-the-art dental clinic was opened capable ofproviding comprehensive treatment, including extractions, root canals, fillings, and prosthodontic (i.e. crowns and dentures) work. Preventative dental care and education about oral hygiene are emphasised with special attention given to the ill effects of qat use. Routine primary care is provided to patients in the Zahra clinic which has an area of approximately 2000 square feet and includes living quarters for the staff. The clinic is equipped with a delivery room,in-patient ward, dental suite, and OPD. There is a complete lab, ECG, spirometry, ultrasound, and a fully stocked pharmacy. 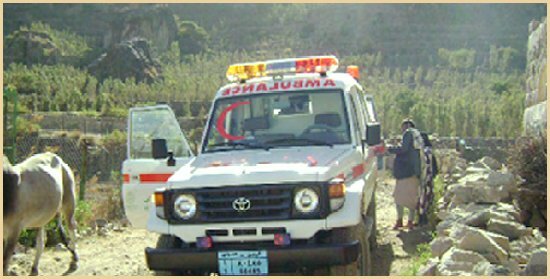 In May of 2007, a specially-modified ambulance built on a 4×4 Land Cruiser was donated and this vehicle allowed expansion of the outreach program. Since then the clinic has continued to expand its range of treatments including child vaccination programs and eye care. It has also implemented a comprehensive training programme and in particular 12 ladies have been given practical training as nurse’s aides. Another 2 ladies have seen sent for professional nursing training in Sana’a and (prior to the recent hostilities) the aim was to send 2-3 people from the region for training every year.